Keratin is any one of the family of tough and insoluble fibrous structural proteins that form the chief, hard, nonmineralized structural component of hair, wool, horns, nails, claws, hooves, and other vertebrate tissues, as well as part of various invertebrate structures. Keratins are rivaled as biological materials in toughness only by chitin. Keratins are present in all epithelial cells, both those covering the external surfaces of organisms and those on internal surfaces, such as the lining of the digestive tract. 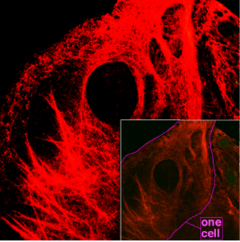 Keratins aid the epithelial cells in maintaining their connected integrity, as the keratins typically span the full interior width of a cell and are connected indirectly to keratins in adjoining cells through cell-to-cell junctions called desmosomes. The horn, hooves, nails, hair, and other keratin-based hard, tough materials growing on animals are produced by epithelial cells adapted to growing an abundance of keratin and then dying as individual cells while leaving the keratin to help form a structure valuable to the whole animal. Keratin's characteristic toughness and resilience depend on its amino acid composition and sequence and the particular protein folding that results. In particular, the prevalence in Keratin of the sulfur-containing amino acid cysteine, with its ability to form strong covalent chemical bonds between sulfur atoms (disulfide bridge), helps confer strength and rigidity. The complexity involved in just this one type of protein is remarkable, and yet it is formed by a vast diversity of living organisms. There are various types of keratins within a single animal. Keratin is nutritionally useless to humans, since it is not hydrolyzed by digestive enzymes, but it can be used as fertilizer, being slowly broken down by bacteria (Bender and Bender 2005). The α-keratins are formed primarily as helical fibers, while the β-keratins are formed primarily in beta sheets. Some beta sheets are also found in α-keratins (Kreplak et al. 2004). For example, hair, a filamentous outgrowth from the skin that is found only on mammals, involves fibers comprising nonliving cells whose primary component is the protein keratin, a long chain (polymer) of amino acids that naturally forms an α-helix fiber and subsequently winds two of the α-helix fibers together to form a much stronger "coiled coil" fiber characteristic of α-keratin. The keratinized cells arise from cell division in the hair matrix at the base of a hair follicle and are tightly packed together. Keratins also are a principle part of the cells in the tooth enamel of mammals and the baleen plates of filter-feeding whales. Although it is now difficult to be certain, the prevailing view among paleontologists is that the scales, claws, beaks, and some protective armor of dinosaurs most likely were composed of a type of keratin. In Crossopterygian fish, the outer layer of cosmoid scales was keratin. Among the invertebrates, arthropods such as crustaceans often have parts of their armor or exoskeleton made of keratin, sometimes in combination with chitin, which is a hard, semitransparent polysaccharide that is the main component of the shells of crustaceans, such as crabs, lobsters, and shrimp. In arthropods, however, chitin is frequently modified by being embedded in a hardened proteinaceous matrix of keratin, giving a more rigid exoskeleton, than seen, for example, in the use of chitin in the soft, more pliable body wall of a caterpillar. Keratins also can be integrated in the chitinophosphatic material that makes up the shell and setae (bristles) in many brachiopods. Keratins also are found in the gastrointestinal tracts of many animals, including roundworms (who also have an outer layer made of keratin). The properties that make structural proteins like keratins useful depend on their supermolecular aggregation, i.e., their pattern of protein (polypeptide strand) folding. The properties of collectives of protein strands depend on the properties of the individual polypeptide strands, which depend in turn on their amino acid composition and sequence. The α-helix and β-sheet motifs, and the disulfide bridges, are central to the architecture and aggregation of keratins. Cysteine, an amino acid with the thiol functional group -SH. Cystine, showing a disulfide bond (-S-S-) joining two cysteine residues. Keratins have large amounts of the sulfur-containing amino acid cysteine, which is characterized by the thiol functional group, -SH, comprising a sulfur atom and a hydrogen atom. In the keratin polymer, which is originally extremely flexible, the thiol groups tend to pair up and, through oxidation, form a covalent sulfur-sulfur, that is, disulfide, bond with the loss of two protons and two electrons. 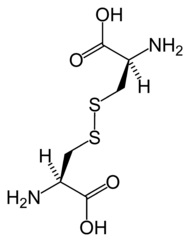 A disulfide bond, also called a SS-bond or disulfide bridge, achieves an overall connectivity represented by C-S-S-C, in which "C" represents the immediate next carbon atom and all the remainder of the associated amino acid. Expressed more formally, when cysteine is oxidized it can form cystine, which is two cysteine residues (cys) joined by a disulfide bond (cys-S-S-cys) between the -SH group. Disulfide bridges confer additional strength and rigidity by permanent, thermally-stable crosslinking—a role sulfur bridges also play in vulcanized rubber. Human hair is approximately 14 percent cysteine. The pungent smells of burning hair and rubber are due to the sulfur compounds formed. Extensive disulfide bonding contributes to the insolubility of keratins, except in dissociating or reducing agents. The more flexible and elastic keratins of hair have fewer interchain disulfide bridges than the keratins in mammalian fingernails, hooves, and claws (homologous structures), which are harder and more like their analogs in other vertebrate classes. Hair and other α-keratins consist of α-helically-coiled single protein strands (with regular intra-chain H-bonding), which are then further wound together into superhelical or coiled-coil ropes that may be further coiled. The β-keratins of reptiles and birds have β-pleated sheets twisted together, then stabilized and hardened by disulfide bridges. The general structure of an amino acid molecule. For glycine, the simplest amino acid, R in the figure is replaced by -H. For alanine, R is replaced by the methyl group -CH3. The amino group (-NH2) is on the left and the carboxyl group (-COOH) is on the right. Keratins contain a high proportion of the smallest of the 20 amino acids, glycine, whose "side group" is a single hydrogen atom. They also contain a high proportion of the next smallest, alanine, whose functional side group is the small and noncharged methyl group. In the case of β-sheets, this high proportion of simple and neutral side groups allows sterically-unhindered hydrogen bonding between the amino and carboxyl groups of peptide bonds on adjacent protein chains, facilitating their close alignment and strong bonding. Fibrous keratin molecules can twist around each other to form double-wound helical intermediate filaments. The triple helix of the (unrelated) structural protein collagen, found in skin, cartilage, and bone, likewise has a high percentage of glycine, as does the connective tissue protein elastin, which also has a high percentage of alanine. Spider silk fibroin, considered a β-keratin, can have glycine and alanine as 75–80 percent of its total amino acids, with an additional 10–15 percent being serine, and the rest being amino acids that have bulky side groups. The chains are antiparallel, with an alternating C → N orientation (Ophardt 2003). A preponderance of amino acids with small, nonreactive side groups is characteristic of structural proteins, for which H-bonded close packing is more important than chemical specificity. 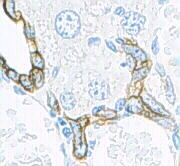 In mammals, there are soft epithelial keratins, the cytokeratins, and harder hair keratins. As certain skin cells differentiate and become cornified, pre-keratin polypeptides are incorporated into intermediate filaments. Eventually, the nucleus and cytoplasmic organelles disappear, metabolism ceases and cells undergo a programmed death as they become fully keratinized. Cells in the epidermis contain a structural matrix of keratin, which makes this outermost layer of the skin almost waterproof, and along with collagen and elastin, gives skin its strength. Rubbing and pressure cause keratin to proliferate with the formation of protective calluses—useful for athletes and on the fingertips of musicians who play stringed instruments. Keratinized epidermal cells are constantly shed and replaced (such as dandruff). These hard, integumentary structures are formed by intercellular cementing of fibers formed from the dead, cornified cells generated by specialized beds deep within the skin. Hair grows continuously and feathers molt and regenerate. The constituent proteins may be phylogenetically homologous but differ somewhat in chemical structure and supermolecular organization. The evolutionary relationships are complex and only partially known. Multiple genes have been identified for the β-keratins in feathers, and this is probably characteristic of all keratins. Another example of keratinzed cells are nails. According to Levit and Boissy (2001), the nail plate is composed of "closely packed, fully keratinized, multilayered lamellae of cornified cells" (Levit and Boissy 2001). Essentially, cells in the epidermis contain a structural matrix of keratin. The nail matrix cells differentiate and create the nail plate by flattening, broadening, and by nuclear fragmentation, with an accumulation of cytoplasmic microfibrils (Levit and Boissy 2001). As skin cells become cornified, and the nucleus and cytoplasmic organelles disappear and metabolism ceases, the cells become fully keratinized. Hard structures are formed by intercellular cementing of fibers formed from the dead, cornified cells.The keratins in the nail plate are believed to be held in place by surrounding globular matrix proteins with a high concentration of disulfide bonds between cystine (rather than by means of calcium, as in bones), creating the rigid structure (Levit and Boissy 2001). Silk found in insect pupae, and in spider webs and egg casings, also has twisted β-pleated sheets incorporated into fibers wound into larger supermolecular aggregates. The structure of the spinnerets on spiders’ tails, and the contributions of their interior glands, provide remarkable control of fast extrusion. Spider silk is typically about 1 to 2 micrometers (µm) thick, compared with about 60 µm for human hair, and more for some mammals. (Hair, or fur, occurs only in mammals.) The biologically and commercially useful properties of silk fibers depend on the organization of multiple adjacent protein chains into hard, crystalline regions of varying size, alternating with flexible, amorphous regions where the chains are randomly coiled (AMO 2002). A somewhat analogous situation occurs with synthetic polymers such as nylon, developed as a silk substitute. Silk from the hornet cocoon contains doublets about 10 µm across, with cores and coating, and may be arranged in up to 10 layers; also in plaques of variable shape. Adult hornets also use silk as a glue, as do spiders. Some infectious fungi, such as those that cause athlete's foot, ringworm, and the amphibian disease chytridiomycosis (caused by the chytrid fungus, Batrachochytrium dendrobatidis), feed on keratin. Although keratin is insoluble and is not easily hydrolysed by digestive enzymes (Bender and Bender 2005), it can be used for coating pills designed to be dissolved when in the intestine. A supplement for ruminants also is made from steamed feather meal (Bender and Bender 2005). Australian Museum Online. 2002. Spiders: Silk structure. Australian Museum Online. Retrieved May 23,2008. Kreplak, L. J. Doucet, P. Dumas, and F. Briki. 2004. New aspects of the alpha-helix to beta-sheet transition in stretched hard alpha-keratin fibers. Biophys J 87(1): 640-7. Retrieved May 23, 2008. Levit, E. K., and R. E. Boissy, R. E. 2001. Chapter 6. Basic science of the nail unit. In R. K. Freinkel, and D. T. Woodley. The Biology of the Skin. New York: Parthenon Pub. Group. ISBN 1850700060. Ophardt, C. E. 2003. Secondary protein—structure. Virtual Chembook. Retrieved May 23, 2008. This page was last modified on 19 September 2008, at 14:48.